Cruise Adventures Travel Company ...Let Us Show You The World!! Graced with eye-catching modern design and four generously sized cabins, 'Grand Cru' is a floating luxury hotel from which to explore Burgundy's cultural treasures. 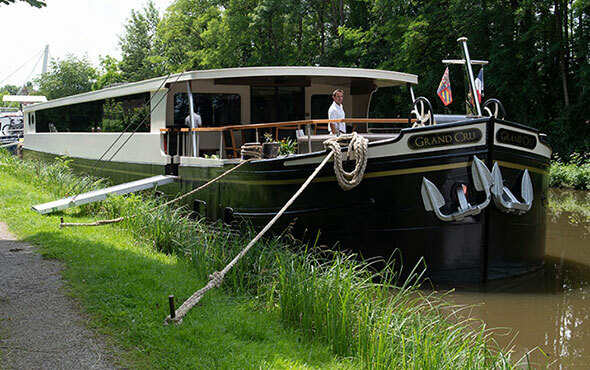 Exclusive to this barge, guests enjoy pours of Grand Cru wines with every lunch and dinner. These most-superior-grade vintages pair perfectly with the gourmet cuisine prepared by the onboard chef. Excursions include a chocolate tasting at Chalon-sur-Saône, wine tasting at family-owned Château de Chassagne-Montrachet, lunch ashore at a Michelin-starred restaurant and a visit to historic Château de la Rochepot.